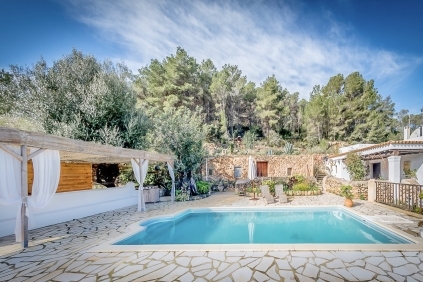 This is a special property for sale in Cala Salada that has, thanks to its south west orientation, sunsets during most of the year. The villa offers absolutely stunning sea views overlooking Conejera and Bledas Islands. The property has a large living room, a separate kitchen, a laundry room, three bedrooms and three bathrooms. There is the possibility of creating a fourth bedroom, which is currently used as an office. First, the ground floor has a large terrace with tropical plants, an 8x4m pool (with rigid coverage) and a barbecue. In addition to a bedroom with sink, a bathroom with shower and a toilet. As well as a second room (office) and a cellar. Second, the main floor has a large living room with air conditioning, fireplace and central heating, an outside terrace (partly glazed), a kitchen with island (fully equipped) with access to a laundry room and magnificent views. Through a large hallway to the master bedroom with en-suite bathroom and a second double bedroom with separate bathroom (with shower, toilet, bidet and washbasin). The last floor presents a garage with access to the main roof area of the house. The extensive equipment of this property includes a broadband of fiber optic and telephone line, water with reserve rain system of 30,000 L capacity, electricity by Endesa, gas in the kitchen by storage bottles, gas central heating, double glazing in windows, as well as blinds and mosquito nets, recent reform in bathrooms and pool, parquet floor with additional insulation and finally, an insulation installation with resistant membrane in the main roof. 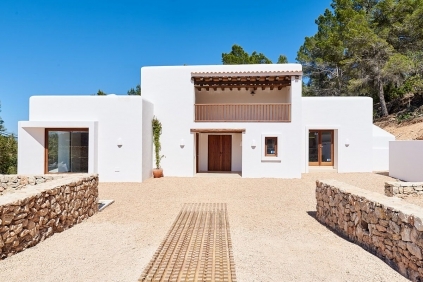 This unique property for sale can be the Ibiza house of your dreams!